Definition at line 49 of file llhudeffectpointat.h. Definition at line 84 of file llhudeffectpointat.cpp. Definition at line 95 of file llhudeffectpointat.cpp. Definition at line 391 of file llhudeffectpointat.cpp. References gAgent, LLAgent::getPosAgentFromGlobal(), LLViewerObject::getPositionAgent(), LLViewerObject::getRenderPosition(), LLViewerObject::getRenderRotation(), LLXform::getWorldRotation(), LLPrimitive::isAvatar(), LLViewerObject::mDrawable, LLHUDObject::mSourceObject, LLHUDObject::mTargetObject, mTargetOffsetGlobal, mTargetPos, LLPointer< Type >::notNull(), and LLVector3::setVec(). Definition at line 288 of file llhudeffectpointat.cpp. References LLVector3d::clearVec(), LLHUDObject::mTargetObject, mTargetOffsetGlobal, mTargetType, NULL, and POINTAT_TARGET_NONE. Referenced by LLHUDEffectPointAt(), markDead(), setPointAt(), and update(). Definition at line 61 of file llhudeffectpointat.h. Definition at line 443 of file llhudeffectpointat.cpp. References LLHUDObject::mSourceObject, mTargetPos, LLPointer< Type >::notNull(), and LLVector3d::setVec(). Definition at line 60 of file llhudeffectpointat.h. Definition at line 298 of file llhudeffectpointat.cpp. References clearPointAtTarget(), LLPointer< Type >::isNull(), LLHUDObject::markDead(), and LLHUDObject::mSourceObject. Definition at line 102 of file llhudeffectpointat.cpp. 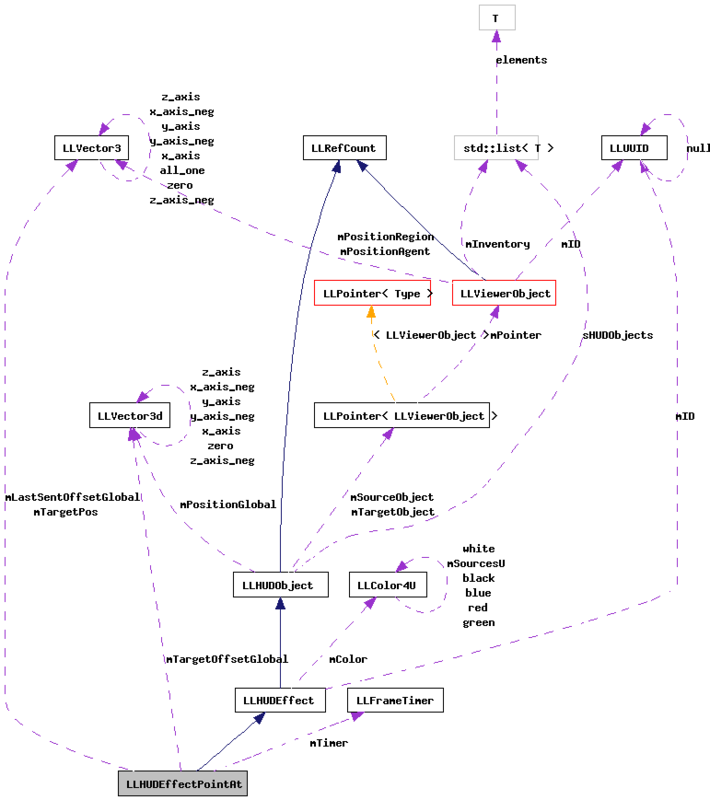 References _PREHASH_TypeData, LLMessageSystem::addBinaryDataFast(), LLFrameTimer::getElapsedTimeF32(), htonmemcpy(), mData, LLVector3d::mdV, mLastSendTime, LLHUDObject::mSourceObject, LLHUDObject::mTargetObject, mTargetOffsetGlobal, mTargetType, mTimer, MVT_LLUUID, MVT_LLVector3d, MVT_U8, LLUUID::null, LLHUDEffect::packData(), PKT_SIZE, POINTAT_TYPE, SOURCE_AVATAR, TARGET_OBJECT, and TARGET_POS. Definition at line 321 of file llhudeffectpointat.cpp. References f, glBegin, glEnd, glPopMatrix, glTranslatef, LLHUDObject::mSourceObject, mTargetPos, mTargetType, POINTAT_TARGET_NONE, sDebugPointAt, target, update(), VX, VY, and VZ. Definition at line 227 of file llhudeffectpointat.cpp. References clearPointAtTarget(), dist_vec(), f, FALSE, gAgent, LLFrameTimer::getElapsedTimeF32(), LLAgent::getPosGlobalFromAgent(), llassert, MAX_SENDS_PER_SEC, LLHUDEffect::mDuration, MIN_DELTAPOS_FOR_UPDATE, mKillTime, mLastSendTime, mLastSentOffsetGlobal, LLHUDObject::mSourceObject, LLHUDObject::mTargetObject, mTargetOffsetGlobal, mTargetType, mTimer, POINTAT_NUM_TARGETS, POINTAT_PRIORITIES, POINTAT_TARGET_CLEAR, POINTAT_TIMEOUTS, LLHUDEffect::setDuration(), LLHUDEffect::setNeedsSendToSim(), LLVector3d::setVec(), TRUE, and update(). Definition at line 309 of file llhudeffectpointat.cpp. Definition at line 208 of file llhudeffectpointat.cpp. Definition at line 217 of file llhudeffectpointat.cpp. References LLHUDObject::mTargetObject, mTargetOffsetGlobal, and NULL. Definition at line 144 of file llhudeffectpointat.cpp. References _PREHASH_Effect, _PREHASH_ID, _PREHASH_TypeData, LLViewerObjectList::findObject(), gAgent, LLMessageSystem::getUUIDFast(), gObjectList, htonmemcpy(), LLPrimitive::isAvatar(), LLUUID::isNull(), LLPointer< Type >::isNull(), llendl, llwarns, LLUUID::mData, LLVector3d::mdV, LLAgent::mPointAt, mTargetType, MVT_LLUUID, MVT_LLVector3d, MVT_U8, PKT_SIZE, POINTAT_TYPE, S32, setSourceObject(), setTargetObjectAndOffset(), setTargetPosGlobal(), size, SOURCE_AVATAR, TARGET_OBJECT, TARGET_POS, LLHUDEffect::unpackData(), and update(). Definition at line 351 of file llhudeffectpointat.cpp. References ANIM_AGENT_EDITING, calcTargetPosition(), clearPointAtTarget(), f, LLFrameTimer::getElapsedTimeF32(), LLPointer< Type >::isNull(), markDead(), mKillTime, LLHUDObject::mSourceObject, LLHUDObject::mTargetObject, mTargetType, mTimer, and POINTAT_TARGET_NONE. Referenced by render(), setPointAt(), and unpackData(). Definition at line 52 of file llhudeffectpointat.h. Definition at line 82 of file llhudeffectpointat.h. Referenced by setPointAt(), and update(). Definition at line 85 of file llhudeffectpointat.h. Referenced by packData(), and setPointAt(). Definition at line 81 of file llhudeffectpointat.h. Definition at line 80 of file llhudeffectpointat.h. Referenced by calcTargetPosition(), clearPointAtTarget(), packData(), setPointAt(), setTargetObjectAndOffset(), and setTargetPosGlobal(). Definition at line 84 of file llhudeffectpointat.h. Referenced by calcTargetPosition(), getPointAtPosAgent(), getPointAtPosGlobal(), and render(). Definition at line 79 of file llhudeffectpointat.h. Referenced by clearPointAtTarget(), getPointAtType(), packData(), render(), setPointAt(), unpackData(), and update(). Definition at line 83 of file llhudeffectpointat.h. Referenced by packData(), setPointAt(), and update(). Definition at line 77 of file llhudeffectpointat.h. Referenced by init_debug_avatar_menu(), and render().